We have a wealth of fantastic ‘small’ guitar and amp builders in the UK, I’m only saying ‘small’ (I don’t mean they’re not very tall) as it seems to be the industry standard way of describing, hand-built, products….because that’s what they are. Hank Marvin, Eric Clapton, Andy Fairweather Low, Wilko Johnson, Noel Gallagher, Gary Moore, KT Tunstall, Katie Melua, Paul Cuddeford, Alex Turner (Arctic Monkeys) and Robin Trower. “History creeps up so many times in this business”, says Denis, “It’s almost as though we have to religiously follow the rules written in stone. For example, I build my cabinets from pine, nothing wrong with that, it’s a good timber to work with, it’s strong and light and people want a lightweight cabinet. But often I get people saying pine is the best wood for cabinets because Fender used pine on all their amps back in the day, so that must be the best wood to use. It is one of the sweeter sounding woods for speaker cabinets and combos, but I don’t believe it was anything to do with technical ability, it was just because pine was readily available. We are talking about the USA where there are a million and one pine trees, but good old history says we must use pine as it sounds sweeter. During his early years, the Cornell house was alive with.…no, not late 50’s rhythm and blues, skiffle or jazz, classical was first and foremost. “My story is so like old school players from that age, we have so much in common. I saved up enough money to buy an electric guitar which I played unplugged for months and months, I didn’t have an amp, and my dad, who was heavily into the likes of Beethoven and Tchaikovsky (I was allowed in the room, but had to sit still and quiet when he played these records), said no way was he going to buy an amp for me to play the devils music on”, Denis laughs out loud, “Any chance of that went straight out the window when the amazing Jimi Hendrix came on the scene around the mid 60’s. But I owned a guitar which was marvellous and knew some chords, took it to school where you were ‘somebody’ if you could play, albeit badly. It was years before I knew it was a Telecaster copy, I’d never seen a Tele or a Strat, to me, it was just an electric guitar. I circumed to the fact that I wasn’t going to get an amp from my parents so I started to play around with Dad’s valve radio and hooked the guitar up to the phono socket. I couldn’t believe what I was hearing and how the guitar came alive when it was amplified. After all that time strumming chords on an unplugged electric guitar, here I was playing the devils music through my Dad’s radio. So I’m a fourteen year old guitar player who’s also fascinated by amplifiers and within months had my own combo, a Watkins Dominator which I immediately took apart and tried to fit bigger speakers . All kinds of things a young lad shouldn’t be doing at that age. From there I did my 5 year Radio and TV apprenticeship aged 16, of course back then it was all about valves, we did learn about transistors but they were a relatively new development. I didn’t really get into transistors until later on. During my apprenticeship, I was making potentiometers working for a firm called Egen Electrics, which was part of Phillips E.K. Cole Ltd. It was of course part of that great big industry which offered apprenticeships to youngsters, I must admit I always go back to those days, as I learnt so much working my way up in all the departments, the likes of the offices, the machine shops and if you went to another company you only had to say you had completed an apprenticeship with E.K Cole and you were in straight away. My first main job after my apprenticeship was working for Dallas Arbiter, they had a job advertised in Southend at Dallas Music Industries. 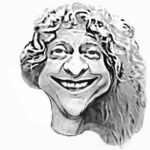 I was interviewed by a clever guy who designed radar in the war, and he was there designing sound city amps along with Dave Reeves who was about to leave and start up Hiwatt amps, so they wanted someone to more or less take over the position that he had. This guy was also clever enough to realise, that even after my apprenticeship, I didn’t have enough qualifications for the job. It was almost over when he asked me what I knew about guitars. It was a different story when I said I played guitar and built amps. He then said what about fuzz boxes? Yes those as well, so I got the job. So here’s this really clever guy who was teaching me all about the circuits and building amps and I was testing them and giving minion on the performance. So we had a great partnership designing and building the early Sound city valve amps, the 50 Plus for example and the 120 of which we made so many. They went all over the world. There were about ten women handling the wiring and soldering but even back then, we were making 40 a day. A lot went to Germany, they were built really well and probably still going out there somewhere today. 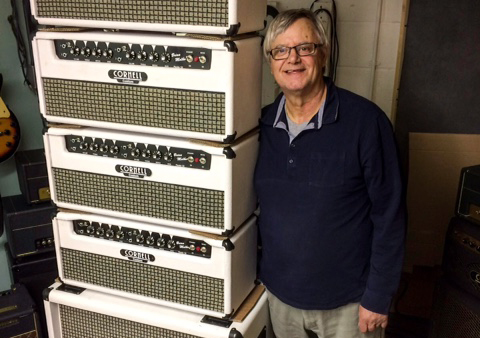 When Dallas Arbiter took Vox over in ’72, I worked with company founder Tom Jennings making Vox amps for the next few years. 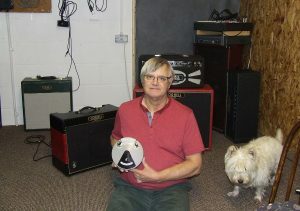 When Ivor Arbiter decided to sell Dallas Arbiter and just stay involved with Fender and the guitars, I was out of work for a while, possibly three years until I got a phone call from Arbiter saying they were now importing Fender amps as well and they needed an engineer for repairs and servicing. At the time, these would have been the CBS range of ‘silver face’ amps. Up until then, I’d been keeping my hand in working in various guitars shops, but as Del Boy would say I was really self unemployed”, Denis chuckles in almost the same South London accent. So when did you start to build your own amps under the Cornell banner? 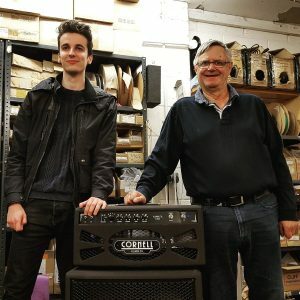 “Well, from day one, I’d always wanted to build my own amps, and as far back as Arbiter closing down, I was in contact with a rep that carried some of my own stock. He sold a few but he fell along the wayside not long after. These amps, my first, were actually transistor amps and they’re still around today. But again history raises its head, it was the Maggie Thatcher era. We all had mortgages to pay and it collapsed before I could get it off the ground and so it was back to working for the guitar shops. It was a tough time and there was no way I could start my own business and make amps off my own back. But I was always doing something and I thought I’ll just wait for it to come to me and it did very slowly. Folk were asking to make them amps and fuzz boxes. I was involved with the original Arbiter Fuzz Face, going back to when I started working at CBS Arbiter when they were called Dallas Musical Industries. Ivor Arbiter, was responsible for the round shape of the chassis, which was the bottom casting on a microphone stand he used to put the fuzz face circuit in. 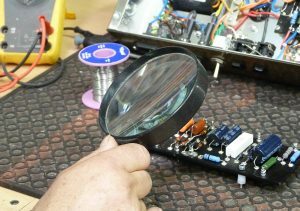 My job was to test them before they went out but straight away I identified a problem as the germanium transistors were varying in output. 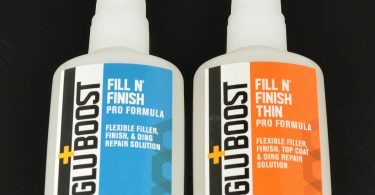 It all went wrong when the pedal surfaced under the Dunlop brand in the USA unbeknown to Arbiter in the UK. Johnny decided to make his own models registered here in the UK and Europe in the same round casting and as I was testing the originals, he asked me to make this now legendary fuzz unit. I built about 1,000 of them and we relaunched them in 1999. ‘History’ again, well, USA solicitors got involved and squeezed me out saying I couldn’t use Fuzz Face, so I built my own version under the Cornell brand called The First Fuzz, as that was the original circuit I used in the Fuzz Face. I’m still making them with the Germanium transistors, even though they are now hard to find. Hand-built as we know means a relatively expensive product produced in comparatively small numbers compared to mass produced and affordable. “That’s right, I can’t deliver vast quantities at a time and it’s the reason why I’m running around in a Datsun car”, more laughter. “It’s the entrepreneurs that make the money, and they get pleasure from it. I get pleasure from making amplifiers and I’m making amps that will last for years, not something that’s going to pack up pretty soon. Some of my original valve amps that have been out there working hard for 15 years come in for a service and they’re ready to go for another 15 and some are selling for a lot more than they originally cost. I’ve always been conscious of the fact that hand-built amps cost more, especially when youngsters have said they’d love one of my amps but just can’t afford it. So I’m introducing the Cornell Traveller 5 which is launching late summer 2018. This is a 5 watt all valve combo, specifically designed for people who can’t afford the bigger amps in the Cornell range of combos, the likes of Romany, Plexi, Vintage Brown and the Acoustic Series. The Traveller sells for £499, which leaves me with a tight margin indeed. 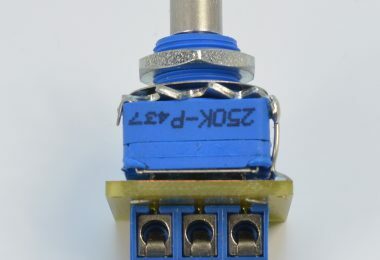 It’s all hand built, but we’ve used rocker switches instead of expensive toggle switches for example to keep the cost down, but in no way has the build or tone been compromised, all the components that make the Cornell sounds are still in there, like carbon resistors, quality caps and high quality pots. I’ve also used an 8in speaker and to eliminate the honky characteristics of this size speaker, I’ve installed a filter to squash the mid frequencies on the clean channel only, so the overdrive has the mids to cut through, this is operable via the clean/mean switch on the control panel. I don’t install master volume controls because people like the switchable power down options, this is an attenuating network I’ve designed that takes it down to about a tenth of a watt, the full 5 watts when cranked is surprisingly loud. 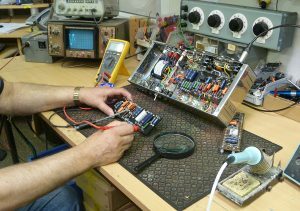 What to you is the best part of making an amp, the new design or maybe final plug in and test? “I think it’s the customer satisfaction, like building the Traveller 5 for a purpose. If you went to get a suit made in London’s Savile Row, they’d measure you up and you get a suit that fits perfectly and you look really nice and posh. It’s the same here, well not to buy a suit, but customers come in with a problem that I can solve. They can hear a sound in their head, maybe less distortion with a ton of headroom, or the other way around, either way around, I can build the best amp for their needs. Without mentioning the ‘best’ or ’history’ words, there are of course, many components that contribute to an amplifiers build and sonic characteristic, how much closer to home can you keep that? 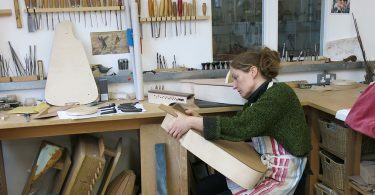 Claire Dugué Hurdy Gurdy Luthier. A.J. LUCAS GUITARS/TEACHING AT NEWARK COLLEGE. Musical expression before ‘History’. Way more fun if you ask me!